I like editing— and I’m good at it. My first position as an editor had a tough boss— me. Come to think of it, I was in charge of layout too! In my junior year of high school I took it upon myself to compile my dozen or so (very badly written) short stories into a book, which I presented to my English teacher. I typed 80 or so pages with my index fingers; it took weeks. I taught myself to type shortly after that experience; today I type at more than 100 words per minute. In the early 1980s I was one of many editors for Voice of the Valley, the newsletter of Greene Valley Developmental Center. A few years later I was named the founding editor of the Nashville VIC Users (soon to be Nashville Commodore Users Group) magazine. 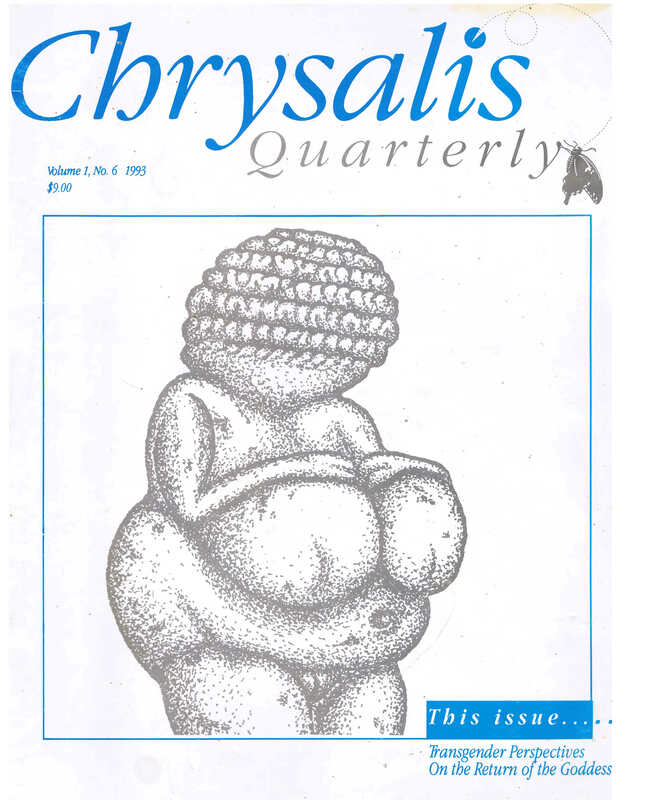 In the 1990s I created, edited, and laid out a magazine called Chrysalis Quarterly (later Chrysalis: The Journal of Transgressive Gender Issues), four or five newsletters, flyers, advertisements, offprints, and an assortment of books and booklets. Between 1999 and 2008 I was editor of Transgender Tapestry, the journal of the International Foundation for Gender Education. In the early 2000s I edited and laid out a political newsletter in my tiny town of 800 souls. I also put in a half-dozen years editing and laying out the program book for the transgender conference Fantasia Fair. Now I’m designing and populating this website! All through the 1990s I did the editing and layout work for the 501(c)(3) nonprofit American Educational Gender Information Service. This included AEGIS’s flagship journal Chrysalis, a variety of newsletters, and assorted flyers, brochures, and booklets. I laid out materials for other nonprofits as well, using the design program Quark XPress. My first layout job was in 1980, as editor of the newsletter of The Nashville VIC-20 Users Group. I inherited a mimeographed two-page typed newsletter and proposed something that astonished my fellow computer enthusiasts: I would produce the magazine entirely with the computer, using a primitive word processor and a dot-matrix printer. And so I did. Desktop publishing was born in 1984 with the introduction of Apple’s Macintosh— but I didn’t have a Mac or a laser printer. In 1991 I was forced to simultaneously learn typography, how to lay out pages for publication, the page layout program Quark XPress, and the Macintosh operating system— and I had to somehow acquire a Mac! The necessity came about because I lost the layout person for Chrysalis Quarterly, the house journal for the nonprofit organization I had founded. That nonprofit was AEGIS, The American Educational Gender Information Gender Service. It required monumental effort, but I managed, somehow, to get the magazine out almost on time. Kudos and accolades! It’s a skill that has stood me in good stead. In the years since I’ve laid out flyers, advertisements, newsletters, booklets, and books. That experience, and the great WordPress themes at Elegant Themes, prepared me for another overwhelming job— designing and implementing this website. 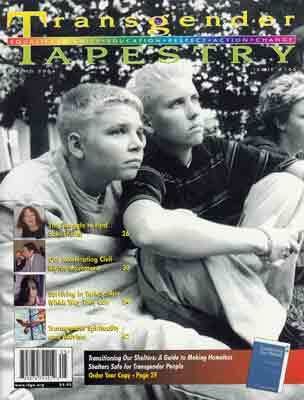 In 1998 I was hired as editor-in-chief of the International Foundation for Gender Education’s flagship journal, Transgender Tapestry. Over the next eight years I edited 22 issues. Tapestry originated as the newsletter of Boston’s Tiffany Club and evolved into an important tool for the transgender community. Issues included listings of professionals, and, for many years, support groups. Those listings helped many transsexual and transgender people find the support they needed—myself included. I enjoyed my time with the magazine, which folded shortly after I resigned my position. IFGE is no more, but for some ten years it was the trans community’s premiere organization. I’m especially proud of issue 100; for I was working with a layout artist who had the skill to realize my vision for the issue. Click on the top button to view issue no. 100 or the bottom button to view, courtesy of the Digital Transgender Archive, the issues I edited (Nos 89-110) and many of the issues I didn’t. In 1990 I founded the nonprofit American Educational Gender Information Service. 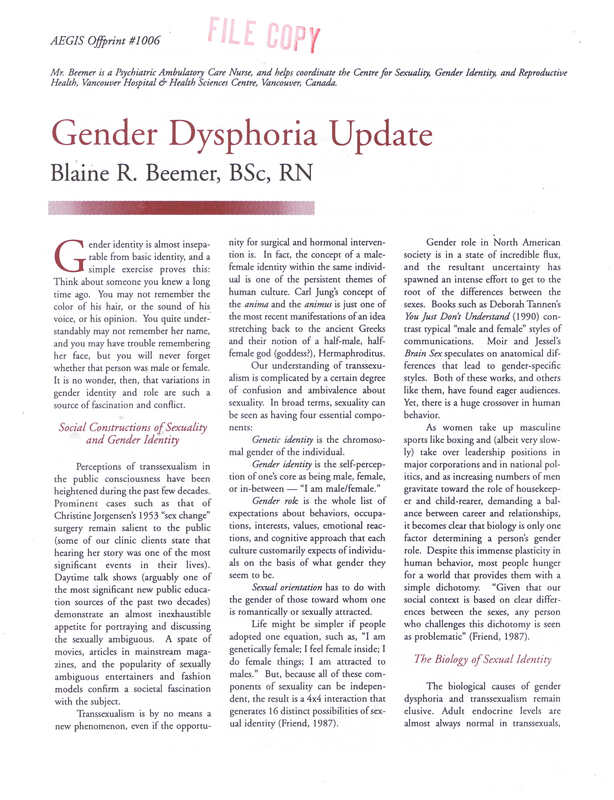 AEGIS advocated for the rights of transsexual and transgendered people, provided free referrals and information, and published a magazine, three newsletters, medical advisory bulletins, offprints, booklets, and books. I was editor for it all. Rites of Passage began as a magazine published by activist Anne Ogborn. It became a newsletter after the second New Woman’s Conference; in fact, it became the official newsletter of the conference. I edited the magazine and did layout. The layout wasn’t my best effort. The New Woman Conference was a three-day retreat for post-operative transsexual women. It ran for perhaps a half-dozen years. Fantasia Fair is the transgender community’s longest-running event. I has been held every October since 1974 at the very tip of Cape Cod in Provincetown, Massachusetts. I’ve attended every year but once since 1990 or 1991. The Fair is a fabulous event, small, intimate, reasonable so far as price goes, and it lasts an entire week. I’ve served in almost every capacity on the Fair Organizing Committee and the two nonprofits which have hosted it— The Outreach Institute for Gender Studies and Real Life Experiences. I’ve been at various times office manager, director of programs, registrar, board member, board chair, the editor and layout person for the program book, and director of the Fair itself. Sometimes I wore several of those hats at once! The program book is a big undertaking, seventy or eighty pages with a glossy cover. It contains general information about Fantasia Fair and Provincetown, the Fair’s host city; program descriptions and descriptions of the evening events; autobiographies of presenters, and lots and lots of ads. I edited, laid out, and published the guide for five years (2003-2007). I was program director in 1994 and got undeserved credit as an editor of the program book. In 2009 I was chosen by Real Life Experiences, Inc., the Fair’s parent nonprofit, to receive the Transgender Pioneer Award. I made the cover. Thankfully, Jamie Dailey was the editor and publisher that year! In 1981 my desire to own a computer was realized when I bought a newly-released Commodore VIC-20 Color Computer. 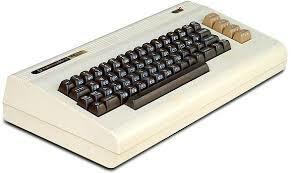 With an 8-bit MOS 6502 processor, 5 MB of RAM, and built-in Microsoft BASIC programming language, my VIC-20 was a joy. I quickly mastered BASIC. Months later, I was a founding member of the Nashville VIC-20 Users Group. In 1982 the VIC Users Group merged with the new Commodore 64 Users Group to form the Nashville Commodore Users Group. I was an officer, as I had been in the VIC Users group, serving as Secretary and sometimes as magazine editor. The first two issues of the VIC Users Group were typed by President Dave Rushing. When I was asked to take the position of editor I stunned the executive committee by announcing my intention to produce the newsletter on the VIC. I proceeded to do just that. As a computer, the VIC-20’s primary limitation was a display width just 22 characters wide. In other areas it equaled and often surpassed more expensive computers such as the Atari 800 and the Apple II. It had a full-width keyboard, displayed 16 colors, and could play music through three programmable voices. RAM could be expanded to 32 mb via cartridges. A variety of ports made it easy to connect to a variety of perhipherals— datasette, disk drive, printer, monitor, speech synthesizers, and X10 home automation modules. I overcame the 22-character limitation with an inexpensive Quick Brown Fox cartridge which provided a powerful word processor and a display of 80 columns. My first issue was, sure enough, generated on the computer. I printed issues on either my Star Micronics dot-matrix printer or a Smith-Corona that used typewriter keys. The magazine would have looked better had it been laser-printed, but that technology wouldn’t become available until 1984, with the introduction of Apple’s Lisa and Macintosh computers and Hewlett-Packard’s first LaserJet. The laser printer had been invented in 1969, but in 1982 the Xerox star cost $1700. Nonetheless, the magazine was a step up photocopied typewritten pages. I’ve posted an example of an issue from 1986. 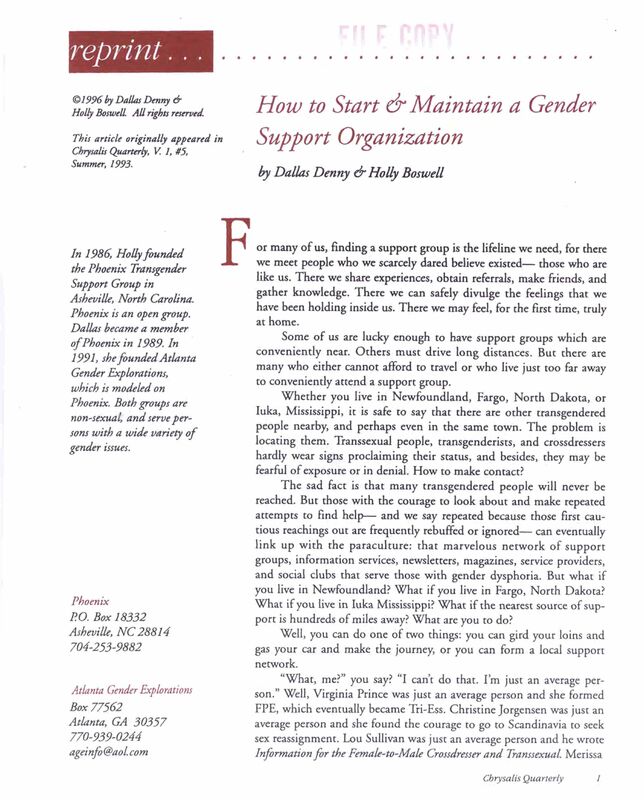 In 1989, as I was preparing for transition, I was looking for a support group for transsexuals—if there was indeed such a thing. Eventually I found a copy of Transgender Tapestry magazine, and inside I found a listing for the The Montgomery Medical and Psychological Institute in Atlanta. Despite the pretentious name, MM&PI was a support group for transsexuals. I phoned daily for three months before someone picked up the phone. I pleaded my case and got a call back from Jerry Montgomery, who set up an interview at his home. When I interviewed Jerry and his wife Lynn were so impressed with my history and credentials they begged me to run their group. I knew they were both in ill health, but was still reluctant to agree— but when they scheduled a sit-down with psychologist James Powelland offered me a free place to live when I transitioned, I said yes. Our first issue, V. 6, No. 1, appeared in the spring of 1990. I served as editor for several issues before I moved out of the Montgomery’s’ house into my own place and began planning the launch of the nonprofit American Educational Gender Information Service. Here’s a link to that first issue Margaux and I produced. My other issues are housed in Ann Arbor at the University of Michigan. In 1994 the Atlanta SSS chapter hosted the Eastern Division’s 17th annual meeting. I volunteered to design and lay out the program book with the page layout program Quark XPress.